This is a recipe I go back to again and again, and never get tired of. I spotted it a couple of years ago when I first found Melissa’s blog “IBreatheImHungry” (through Sonia’s), and since then it one has been on high rotation at my place. A tried and true recipe, I make so often. Simple, nutritious, tasty and guarantees a happy and healthy feed. Definitely my kind of recipe. You guys know how much I love cauliflower — I even wrote a post dedicated to it: Cauliflower power (somehow implying that this cruciferous vegetable is - at least to my eyes - a superhero in the kitchen). But seriously, if I have to pick one vegetable that is a real trouper in the kitchen, I’ll definitely go with cauliflower. Charred, caramelized, creamed, kneaded into pizza dough, used to make alfredo sauce, hummus, tater tots, biscuits, wraps, tortillas and - last but not least - mashed. Yes people, mashed cauliflower is ze thing. Still suspicious? Then I urge you to reconsider. Open your mind and let mashed cauliflower into your life. You won’t be disappointed. 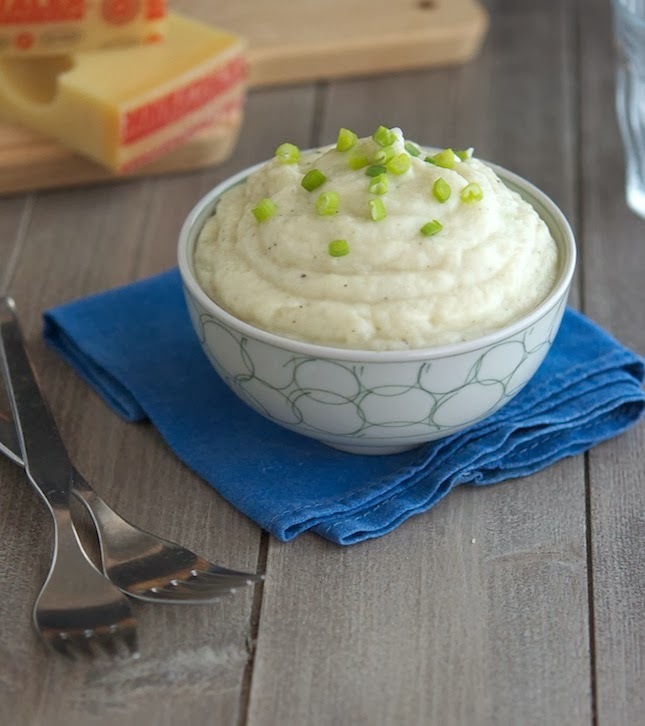 Only 15 minutes stand between you and the creamiest, most delicious mashed cauliflower ever. All it takes is a microwave, a safe-proof microwave bowl (with a lid), an immersion blender (or a stand blender), 4 ingredients and some seasoning. Simple. You don’t think you’re much of a cauliflower person? Then think again my friend, this recipe is going to knock your socks off. Over time I’ve slightly adapted Melissa’s recipe and made it my own, to better meet my taste preferences. Place cauliflower florets in a microwave safe bowl with milk and butter, cover with a lid (do not forget the lid, it’s necessary to retain the moisture) and cook on high for 8 minutes. Take out of the microwave, give it a good a stir, cover with the lid and microwave on high for further 6 minutes. While it’s still hot and steamy, add the shredded cheese, salt and pepper, and using an immersion blender (or using a stand blender) blend until smooth and creamy. Top with some chopped scallion and serve. One serving yields 120 calories, 7 grams of fat, 9 grams of carbs and 7 grams of protein. You should totally do it Lauren. I'm betting 10 bucks he's going to fall in love with it and before you know it, he'll jump on the cauliflower bandwagon and never get off. Perfect timing, I've been looking for a mashed potato alternative for a shepards pie this week. Can't wait to try! Shepards pie??? Really? One of my fave dishes ever. 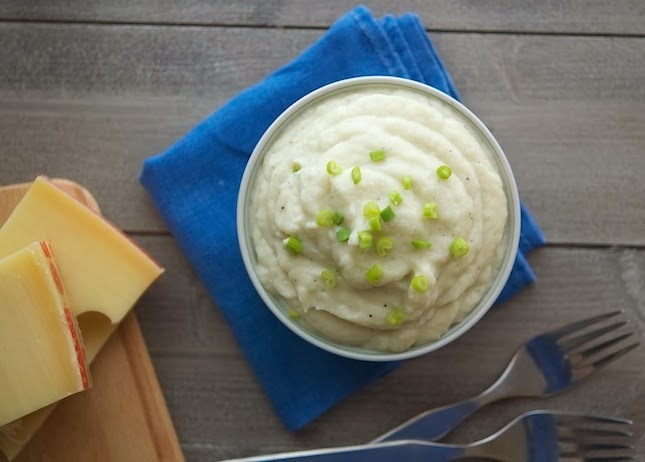 Toppingit with mashed cauli instead of potatoes it's a smart move. I should try it as well! 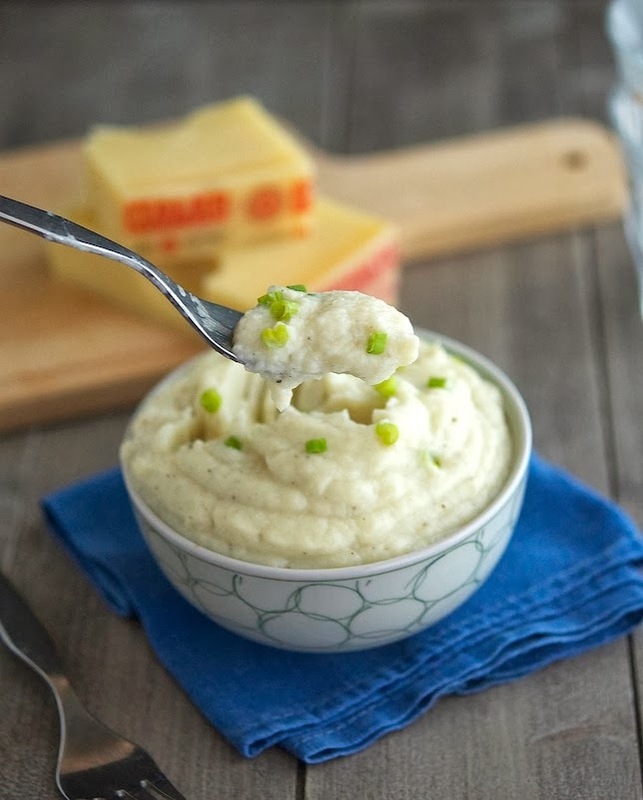 I was looking for a good cauliflower puree recipe last night - I need to try this! We don't have a microwave but thats an easy adaptation - thanks for sharing! You can most definitely steam the cauliflower instead of microwaving it, I'm positive it will work just fine. This is fantastic Mike, can't wait to try it! You should Corinne, it's so simple and yummy! mmmmmmmmmmm yum! 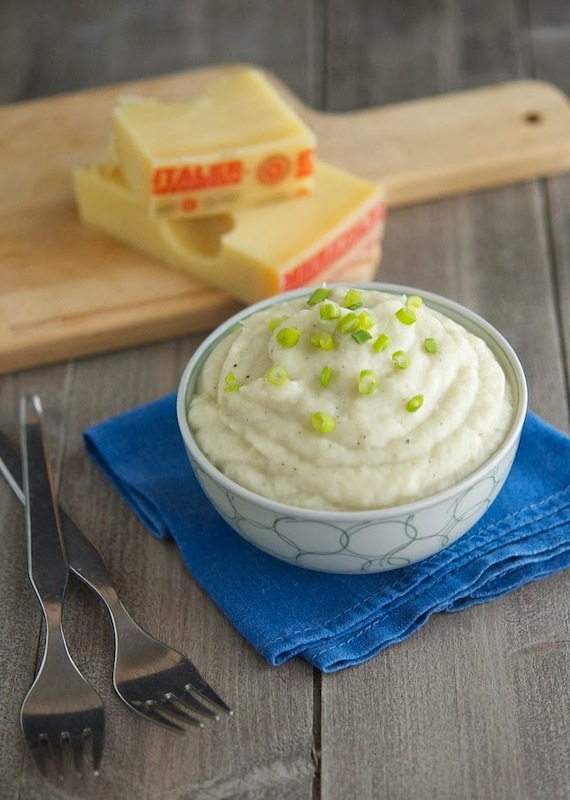 great recipe, I love cauliflower mash as well as broccoli couscous or rice so good! This looks so good! I tried to make mashed cauliflower once and it was a complete disaster ... clearly I need to revisit. This recipe is fool proof MM, do try it! Wow - this is one heck of a creamy bowl of cauliflower, Mike! Jess has a great idea - this would indeed be an amazing sub for mashed potato on shepherds pie! I have been trying to make a low to no carb version for my mom who is diabetic and thanks Mike and Jess! We're all on the same page then, whoever makes the low carb shepherds pie first should tell the others. Deal? I certainly LOVE cauliflower power too!!! When I saw this recipe I practically started jumping up and down in my seat! I have always wanted to try this but never took the time to find a recipe! I was so excited to see it pop up in my email! That's awesome! Let me know how you like once you try it. I am a (really) picky eater. I think the texture of cauliflower turns me off, but mashing it would negate that! I might have to try this as a substitute for mashed potatoes. 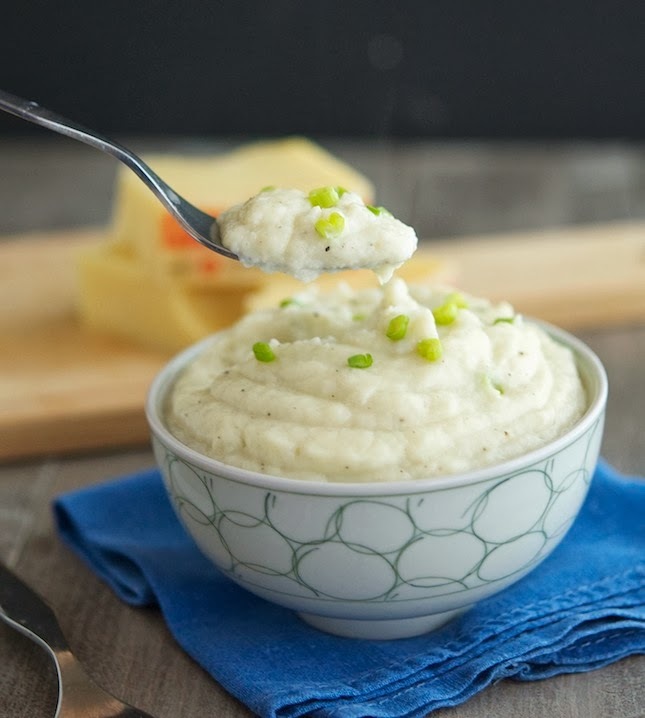 You totally should Krystle, everybody (and I mean everybody, including cauli-haters) loves this mashed cauliflower, it's a total crowd pleaser! Emmenthal cheese hum? I Iike and need to try... and you need to try ghee and roasted garlic with a touch of rosemary. Tu m'en donneras des nouvelles! Ghee, garlic and rosemary you said? Sounds really awesome! Thanks Adam, lemme know how you like it! I made these tonight, but forgot to add the cheese (I was going to use shaved Parmesan). They were terrific, and so smooth. My daughter (27) said the house smelled like a fart, but the mash tasted great. My granddaughter (9) had seconds. I wanted more than my portion, but restrained myself so there would be leftovers for lunch tomorrow.